From ground preparation and planting to the eventual harvesting or felling of the resulting crops, the agriculture & forestry industries rely on a variety of vehicles and equipment to perform a range of arduous tasks. Furthermore, both their reliability and availability are often key for very short periods of time within the calendar year, highlighting the importance of selecting lubricants that offer the customer peace of mind through performance delivery whenever it is needed. At AXEL we know the operational demands of lubricating equipment working predominantly off-road and have a range of both traditional and biodegradable grease technology platforms capable of enhancing the protection of both operational components and the environment. 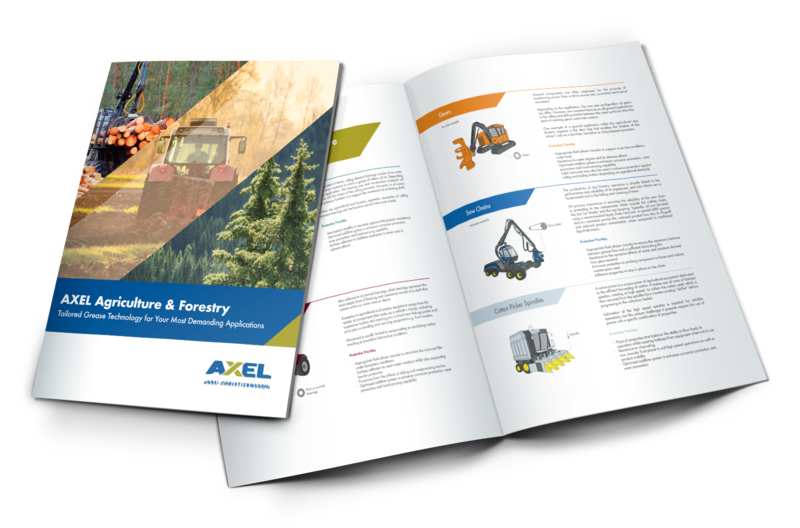 At AXEL, our in-depth knowledge of grease technologies combined with an understanding of operational demands has enabled our team of experts to develop a range of product platforms capable of enhancing component protection when exposed to the conditions of the agricultural and forestry segments.